SAN FRANCISCO, Apr. 09 /CSRwire/ - Today’s workforce is looking for more than just a paycheck; they’re looking for purpose. Employees want their companies to stand for something. Corporate volunteering programs allow companies to put their purpose into action while improving employee engagement and retention. 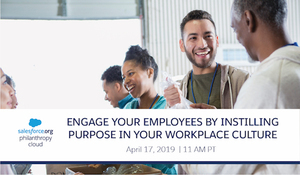 Realized Worth’s Angela Parker and Salesforce.org’s Brandolon Barnett will explore how and why implementing a volunteering program makes the biggest impact on employee engagement.